At this time, the brave and ambitious king, Ethelfrid, governed the kingdom of the Northumbrians, and ravaged the Britons more than all the chiefs of the English, insomuch that he might be compared to Saul of old, king of the Israelites, save only in this, that he was ignorant of Divine religion. For he conquered more territories from the Britons than any other chieftain or king, either subduing the inhabitants and making them tributary, or driving them out and planting the English in their places. To him might justly be applied the saying of the patriarch blessing his son in the person of Saul, 'Benjamin shall ravin as a wolf; in the morning he shall devour the prey, and at night he shall divide the spoil'. Hereupon, Aedan, king of the Scots that dwell in Britain, being alarmed by his success, came against him with a great and mighty army, but was defeated and fled with a few followers; for almost all his army was cut to pieces at a famous place, called Degsastan, that is, Degsa Stone. In which battle also Theodbald, brother to Ethelfrid, was killed, with almost all the forces he commanded. This war Ethelfrid brought to an end in the year of our Lord 603, the eleventh of his own reign, which lasted twenty-four years, and the first year of the reign of Phocas, who then was at the head of the Roman empire. From that time, no king of the Scots durst come into Britain to make war on the English to this day. 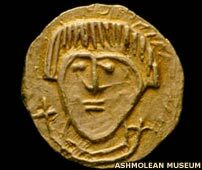 In the meantime, Augustine, with the assistance of King Ethelbert, drew together to a conference the bishops, or doctors, of the next province of the Britons, at a place which is to this day called Augustine's Ac, that is, Augustine's Oak, on the borders of the Wiccii [Hwicce] and West Saxons; and began by brotherly admonitions to persuade them, that preserving Catholic unity with him, they should undertake the common labour of preaching the Gospel to the Gentiles. For they did not keep Easter Sunday at the proper time, but from the fourteenth to the twentieth moon; which computation is contained in a revolution of eighty-four years. Besides, they did several other things which were against the unity of the church. When, after long disputation, they did not comply with the entreaties, exhortations, or rebukes of Augustine and his companions, but, preferred their own traditions before all the churches in the world, which in Christ agree among themselves, the holy father, Augustine, put an end to this troublesome and tedious contention, saying, 'Let us beg of God, who causes those who are of one mind to live in his Father's house, that He will vouchsafe, by his heavenly tokens, to declare to us, which tradition is to be followed; and by what means we are to find our way to his heavenly kingdom. Let some infirm person be brought, and let the faith and practice of those, by whose prayers he shall be healed, be looked - upon as acceptable to God, and be adopted by all'. The adverse party unwillingly consenting, a blind man of the English race was brought, who having been presented to the priests of the Britons, found no benefit or cure from their ministry; at length, Augustine, compelled by real necessity, bowed his knees to the Father of our Lord Jesus Christ, praying that the lost sight might be restored to the blind man, and by the corporeal enlightening of one man, the light of spiritual grace might be kindled in the hearts of many of the faithful. Immediately the blind man received sight, and Augustine was by all declared the preacher of the Divine truth. The Britons then confessed, that it was the true way of righteousness which Augustine taught; but that they could not depart from their ancient customs without the consent and leave of their people. They therefore desired that a second synod might be appointed, at which more of their number would be present. This being decreed, there came (as is asserted) seven bishops of the Britons, and many most learned men, particularly from their most noble monastery, which, in the English tongue, is called Bancornburg, over which the Abbot Dinooth is said to have presided at that time. They that were to go to the aforesaid council, repaired first to a certain holy and discreet man, who was wont to lead an eremitical life among them, advising with him, whether they ought, at the preaching of Augustine, to forsake their traditions. He answered, 'If he is a man of God, follow him'. - 'How shall we know that?' said they. He replied, 'Our Lord saith, Take my yoke upon you, and learn of me, for I am meek and lowly in heart if therefore, Augustine is meek and lowly of heart, it to be believed that he has taken upon him the yoke of Christ; and offers the same to you to take upon you. But if he is stern and haughty, it appears that he is not of God, nor are we to regard his words'. They insisted again, 'And how shall we discern even this?' - 'Do you contrive,' said the anchorite, 'that he may first arrive with his company at the place where the synod is to be held; and if at your approach he shall rise up to you, hear him submissively, being assured that he is the servant of Christ; but if he shall despise you, and not rise up to you, whereas you are more in number, let him also be despised by you'. They did as he directed; and it happened that when they came, Augustine was sitting on a chair, which they observing, were in a passion, and charging him with pride, endeavoured to contradict all he said. He said to them, 'You act in many particulars contrary to our custom, or rather the custom of the universal church, and yet, if you will comply with me in these three points, viz. to keep Easter at the due time; to administer baptism, by which we are again born to God, according to the custom of the holy Roman Apostolic Church; and jointly with us to preach the word of God to the English nation, we will readily tolerate all the other things you do, though contrary to our customs'. They answered they would do none of those things, nor receive him as their archbishop; for they alleged among themselves, that 'if he would not now rise up to us, how much more will he contemn us, as of no worth, if we shall begin to be under his subjection?' To whom the man of God, Augustine, is said, in a threatening manner, to have foretold, that in case they would not join in unity with their brethren, they should be warred upon by their enemies; and, if they would not preach the way of life to the English nation, they should at their hands undergo the vengeance of death. All which, through the dispensation of the Divine judgment, fell out exactly as he had predicted. 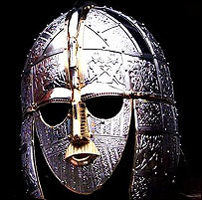 For afterwards the warlike king of the English, Ethelfrid, of whom we have already spoken, having raised a mighty army, made a very great slaughter of that perfidious nation, at the City of Legions, which by the English is called Legacestir, but by the Britons more rightly Carlegion [see Powys, AD 613]. Being about to give battle, he observed their priests, who were come together to offer up their prayers to God for the soldiers, standing apart in a place of more safety; he inquired who they were? or what they came together to do in that place? Most of them were of the monastery of Bangor, in which, it is reported, there was so great a number of monks, that the monastery being divided into seven parts, with a ruler over each, none of those parts contained less than three hundred men, who all lived by the labour of their hands. Many of these, having observed a fast of three days, resorted among others to pray at the aforesaid battle, having one Brocmail appointed for their protector, to defend them whilst they were intent upon their prayers, against the swords of the barbarians. 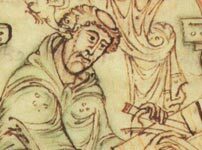 King Ethelfrid being informed of the occasion of their coming, said, 'If then they cry to their God against us, in truth, though they do not bear arms, yet they fight against us, because they oppose us by their prayers'. He, therefore, commanded them to be attacked first, and then destroyed the rest of the impious army, not without considerable loss of his own forces. About twelve hundred of those that came to pray are said to have been killed, and only fifty to have escaped by flight. Brocmail turning his back with his men, at the first approach of the enemy, left those whom he ought to have defended, unarmed and exposed to the swords of the enemies. 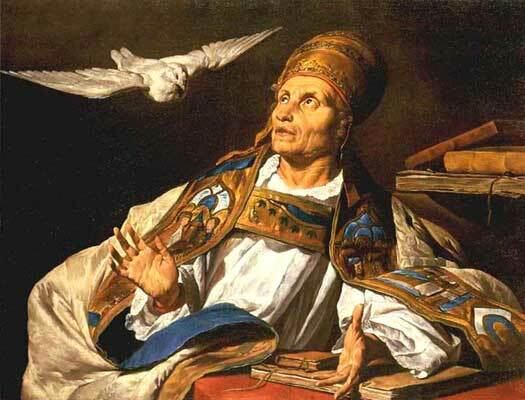 Thus was fulfilled the prediction of the holy Bishop Augustine, though he himself had been long before taken up into the heavenly kingdom; that those perfidious men should feel the vengeance of temporal death also, because they had despised the offer of eternal salvation. 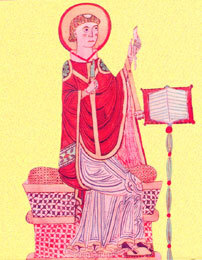 In the year of our Lord 604, Augustine, archbishop of Britain, ordained two bishops, viz. Mellitus and Justus; Mellitus to preach to the province of the East Saxons, who are divided from Kent by the River Thames, and border on the eastern sea. Their metropolis is the city of London, which is situated on the banks of the aforesaid river, and is the mart of many nations resorting to it by sea and land. At that time, Sabert, nephew to Ethelbert by his sister Ricula, reigned over the nation, though he was under subjection to Ethelbert, who, as has been said above, had command over all the nations of the English as far as the River Humber. But when this province also received the word of truth, by the preaching of Mellitus, King Ethelbert built the church of St Paul, in the city of London, where he and his successors should have their episcopal see. As for Justus, Augustine ordained him bishop in Kent, at the city which the English nation named Rhofescestir [Rochester], from one that was formerly the chief man of it, called Rhof. It was almost twenty-four miles distant from the city of Canterbury to the westward, and contains a church dedicated to St Andrew, the apostle. King Ethelbert, who built it, bestowed many gifts on the bishops of both those churches, as well as on that of Canterbury, adding lands and possessions for the use of those who were with the bishops. 'Here rests the Lord Augustine, first archbishop of Canterbury, who, being formerly sent hither by the blessed Gregory, bishop of the city of Rome, and by God's assistance supported with miracles, reduced King Ethelbert and his nation from the worship of idols to the faith of Christ, and having ended the days of his office in peace, died the 26th day of May, in the reign of the same king'. Text copyright © original authors and translators. An original feature for the History Files.